Tobago is one the Caribbean’s most beautiful and unspoilt destinations, 30 miles at its longest point with a population of just 50,000. Beautiful coconut palm fringed white sandy beaches, the turquoise and emerald waters of the Caribbean Sea, jagged cliffs with panoramic views of golden sandy beaches bordered by lush tropical vegetation. Quaint villages surround the island with a variety of exotic fruits and flowers. Economy flights with British Airways from Gatwick Airport (upgrades available, please request a quote if required) on 15th April 2016. Transfers to and from your hotel are included. Accommodation is at the 4 star Coco Reef Resort & Spa (www.cocoreef.com) a classic, elegant Caribbean resort hotel, set in 10 acres of gardens beside its own white sand beach and purpose built lagoon. The guest rooms are all luxuriously appointed in traditional Caribbean style with spacious bathrooms and private patio or balcony. The Coco Reef is located in Crown Point next to a public beach packed with food stalls for cheap and delicious local food. Alternatively stay at Seashells Villas www.seashellsvillas.com, 10 minutes walk from Coco Reef. The Villas each have 3 double bedrooms, 2 bathrooms, private pool and free WiFi. Trip includes 1 day island tour to take in the beautiful town of Charlottesville, the historic Fort James, Argyle Falls, the rain forest and lunch at Gemma’s Treehouse Restaurant. Boat trip in glass bottomed boat with snorkelling in Tobago’s stunning coral reefs, a visit to Nylon Pool which locals say will make you look 10 years younger. With free rum punch, local and soft drinks, music and entertainment from our hosts. Day trip to Castara Beach for Jazz on the Beach where you can walk to the beautiful waterfalls nearby. 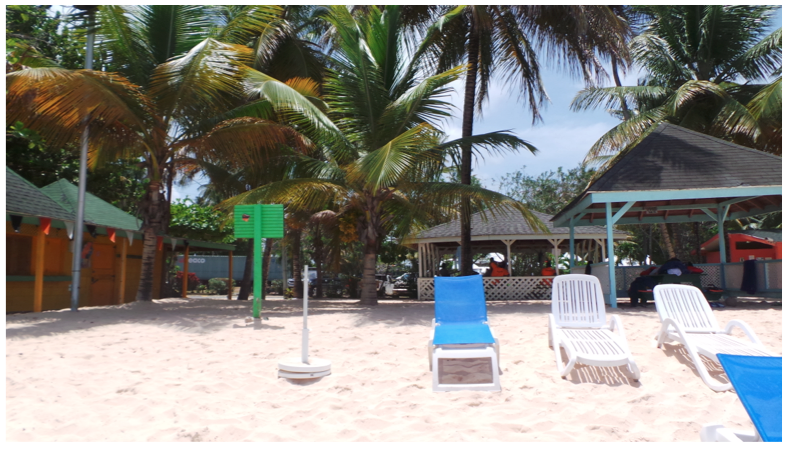 With GeeStor beach games in the afternoon you can listen to local bands playing live on the beach, shop for local crafts and eat local food at the many stalls as well as ‘pulling Seine’ a local tradition that involves pulling in a large fishing net to a backdrop of soca music. Other excursions can be arranged on request. 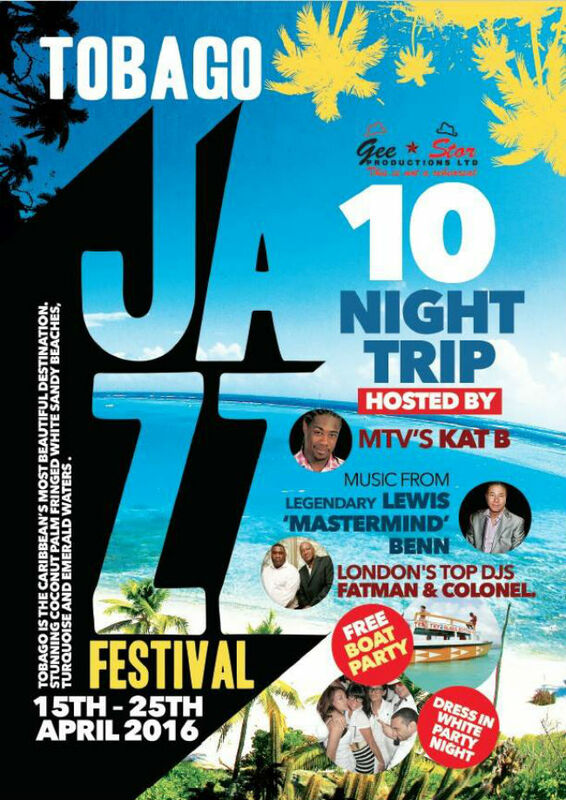 VIP tickets to the Jazz Festival which takes place on the beautiful Pigeon Point Heritage Park over 3 nights will be available to purchase via GeeStor Productions in advance of going on sale in Trinidad & Tobago where they sell out within days. Last year’s headliners were Jill Scott, Jennifer Hudson, Machal Montana, Kook and the Gang, Busy Signal & Romaine Virgo. The previous year saw John Legend, Earth Wind & Fire, Tarrus Riley, Keisha Cole and Brandy, artists in previous years have included Whitney Houston, Dionne Warwick, Emelie Sande, India Arie, Elton John, Rod Stewart and more. After the final performance on Sunday all roads will lead to the weekly local street party The Sunday School where we will rave until morning for those of you who still have the energy! There will also be free time for you to do your own sightseeing, shopping or just to lie on the beach! All trips purchased with Golden Holidays who are ATOL protected. A deposit of £100 secures your place, 50% of the balance is payable by 10th December 2015 and the balance on the 1st February 2016. To book please call or more details please contact sarah@geestor.co.uk or call 07973 801 482. 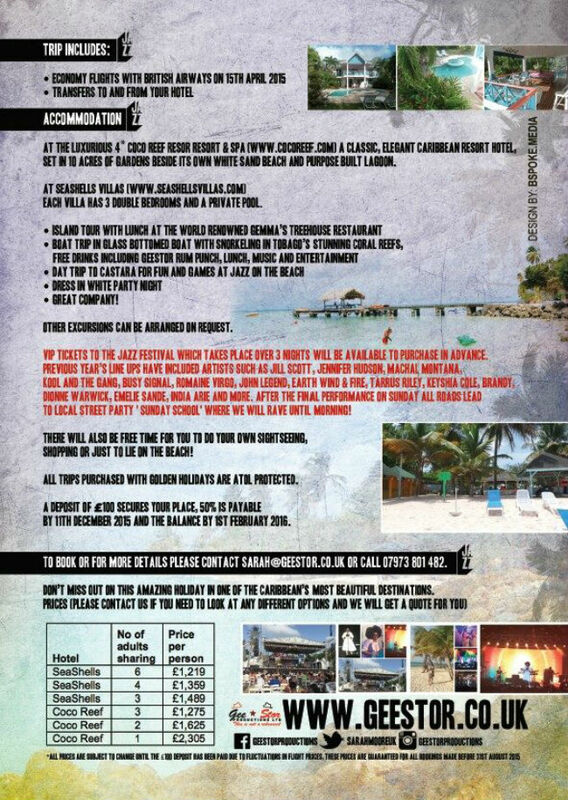 Don’t miss out on this amazing holiday in one of the Caribbean’s most beautiful destinations.